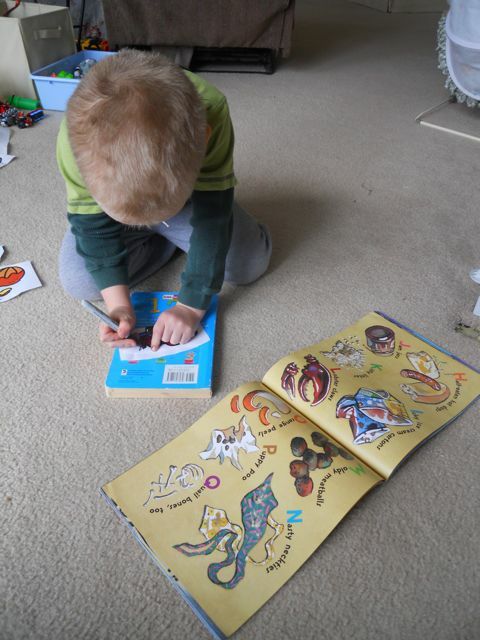 Two years ago, I began creating memorable reading experiences with my family. My then 2 year old son's reaction to an I Stink cake we made for Kate McMullan's birthday in 2010 inspired me to celebrate children's author birthdays with my children. I never thought that by pulling a box of cake mix out of the cupboard would have been a life changing experience, but it was! Since then, my family has celebrated over 120 children's author birthdays and read thousands of books together. We have also made three really great cakes to celebrate Kate McMullan's birthday. 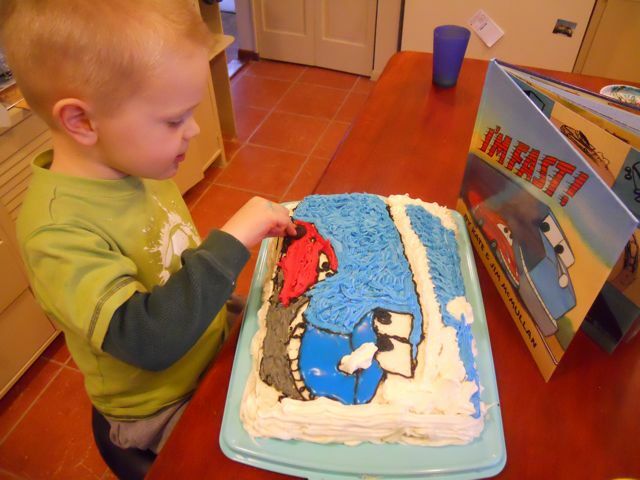 The I Stink cake that started it all in 2010! 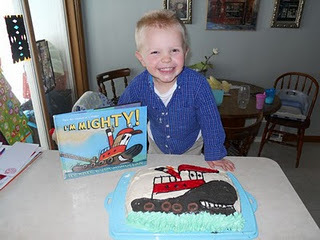 I'm Mighty Cake in 2011! The past two years we enjoyed eating these cakes ourselves, but this year we would be sharing our latest creation with my son's preschool class. 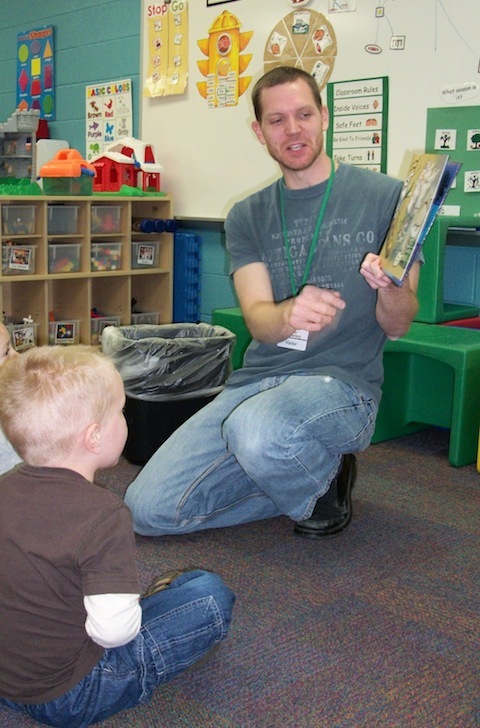 My son's teacher gave me an open invitation to come into the classroom to read when it was convenient for my family. I saw Kate McMullan's birthday as an opportunity to allow my son to share his favorite books with his classmates. The day before the visit, my son and I prepared two activities for his classmates. There was lots of cutting, gluing, mixing and decorating going on at our house. I told my son that he and his classmates were going to make their own I Stink Garbage Trucks. We printed out clip art pictures of many of the garbage items mentioned in I Stink including lobster claws, fish heads, and rotten radishes. 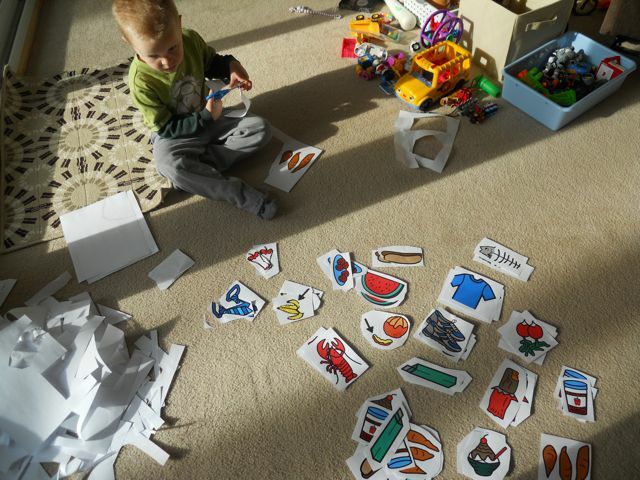 My son helped me cut out the images that would eventually be pasted onto the cardboard box garbage trucks. My son used I Stink to help him write the correct matching letter of alphabet on each image. 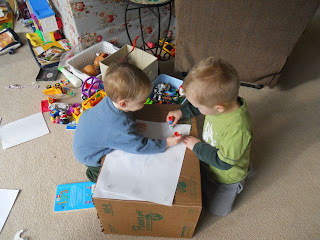 We prepared the large cardboard boxes by covering them with white paper so there would be a clean area to draw and color. The "Glue Guys" did an awesome job preparing for this activity! 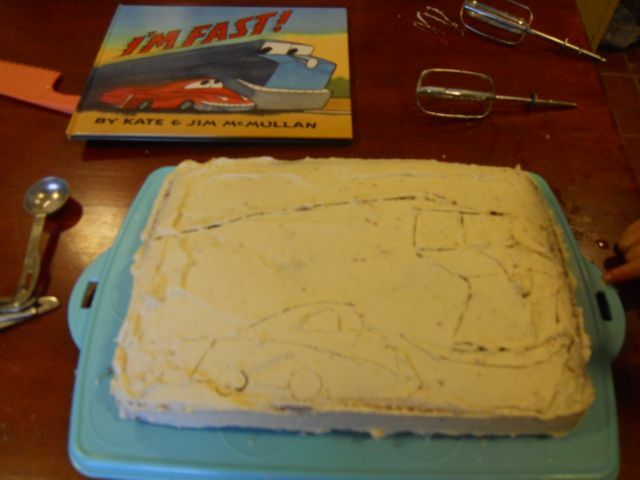 My youngest son went down for a nap then it was time for my oldest and I to get to work on our favorite reading tradition... Kate McMullan Book Cakes! This year we created an I'm Fast cake to celebrate her new book about a freight train who races a red car to Chicago. 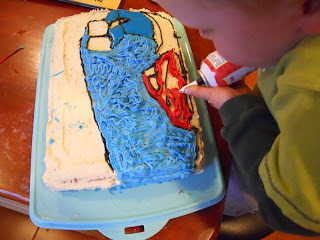 We first applied a base of white frosting to the cake. Then, I sketched out the design with a toothpick. 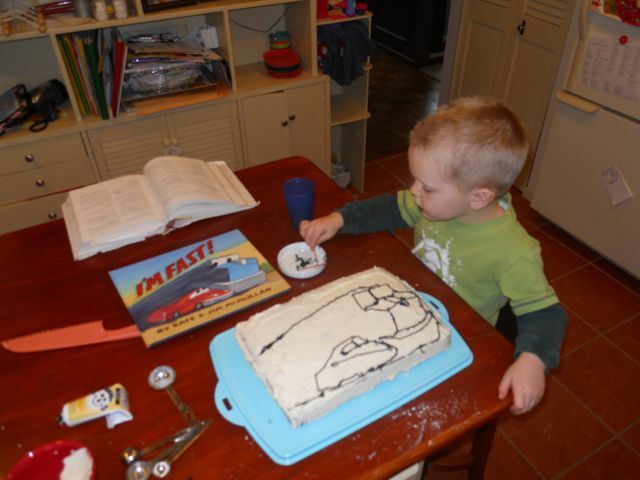 I traced the sketch in black cake icing. Then, we added the color. 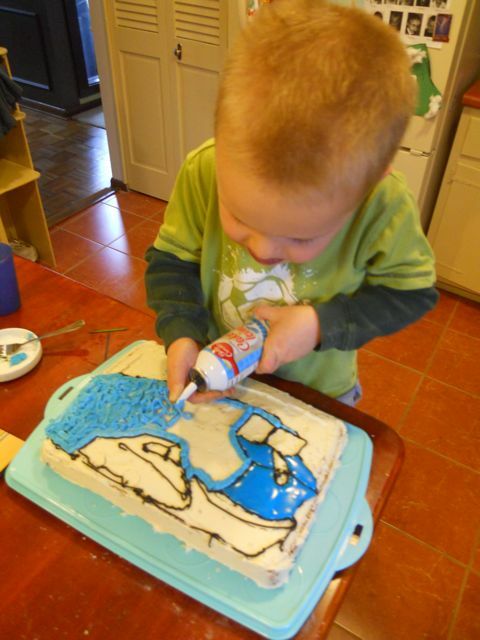 My son was so determined to apply the frosting. 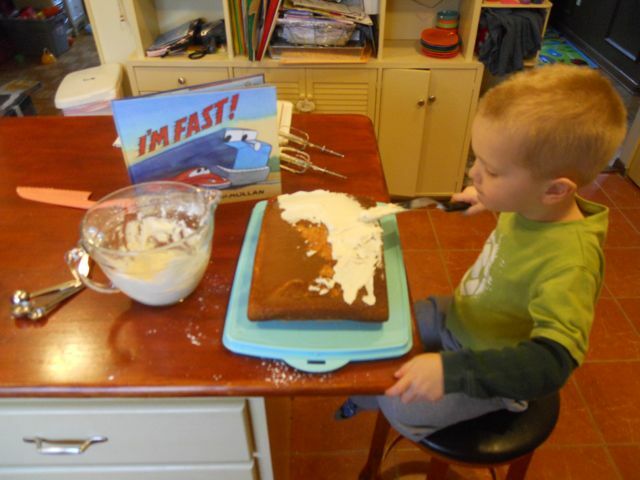 He used all his strength to squirt the frosting from the can. The little red car was a tight area but he stayed in the lines. Two mini oreos for the wheels! Tada! We were quite pleased with the results! My son's preschool class is comprised three and four year olds. It is considered an integrated preschool as it takes typical students and students with special needs. Not only was I spending the morning in the classroom but it was also Dad and Donuts Day. It couldn't have been a better day to spend at preschool! 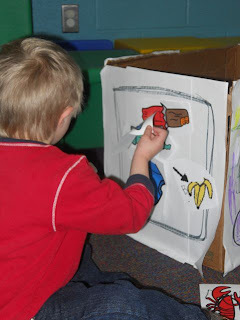 I opened the lesson with a quick introduction to trash -- Where do you put your trash? Where it goes after the trash can is full? Then, I read one of my favorite read alouds, I Stink! The preschoolers loved it! After reading, I told the class that they were going to make their own garbage trucks. I modeled drawing a face, wheels, and a hopper. This box then became the garbage truck used by students who needed a little more support to complete the task. 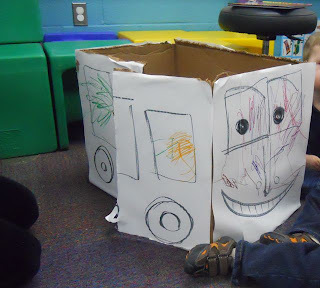 Once the students designed their garbage truck we cut a side door for the students to be able to get in and out of their garbage truck. The last thing that the students needed was for their garbage truck to "EAT SOME TRASH!" The clip art images were added using glue sticks. My time in the class was coming to a close, but it was time for the grand finale. I read I'm Fast! and got the preschoolers chanting "Chooka-Chooka" just like the freight train in the book. I was so impressed with the participation from the students! I left them with the cake to enjoy during their snack time. I want to thank my son's teacher, Miss Lauren, and her co-teacher Miss Jaime, for allowing me to come in and celebrate Kate McMullan's birthday. I truly had a blast! 2010 - The Kate McMullan birthday celebration that started my blog in the right direction. What a neat idea! I love you cake and activity. I bet the preschoolers had a blast. What a fab activity! I'll bet all the boys and girls had a great time with the choosing and glueing-on of their trash pieces onto their trucks - so many tactile-kinesthetic learners at that age. What a superb cake and activity! and Happy Birthday to a very versatile author! THAT is a whole lot of awesome! Wow! I'm impressed with both the creativity and the amount of effort you put into the activity. Well done. Excellent post and great-looking cakes! Cautionary tale: be careful if your son starts to like Batman. My son's black Batman cake left indelible black stains around his and his friends' mouths for quite some time. Makes you wonder what it does to their INSIDES. Thanks everyone! Glad you enjoyed the cake! @sarah - I had a black food coloring experience when I made a mickey mouse birthday cake for my daughter when she was 2! My hands were black for days. Your cakes rock! I'm very impressed by your son's ability to frost. McMullan's books are perfect, lively read alouds for preschoolers...I bet you had fun making all the sounds when reading them, too. Can't wait to get our hands on a copy of I'm Fast. - I usually use crushed Oreos to fill large areas of black on cake (it's not quite black, but close enough). Black frosting is trouble, I agree. I saw you listed on the Comment Challange and thought I would say "hi". What a cool idea. Have you made cupcake cakes? I've seen some really creative ones. Love the trash trucks! How many did the kids end up making? Did they each make their own? The cake's great, too. You need to try fondant the next time you need black... already colored for you at Michaels (40% off coupon) and it's like playing with play dough! Thanks for the all the cake ideas - oreos for black frosting is brilliant. I have never tried a cupcake or fondant. Maybe next year! @Colleen - We made four trash trucks. There were about 16 students so 4 in a group. They worked so well together too. What a cheery and celebratory post! Your sons are very lucky to have a dad who makes author cakes with them. Do you send photos to the authors? 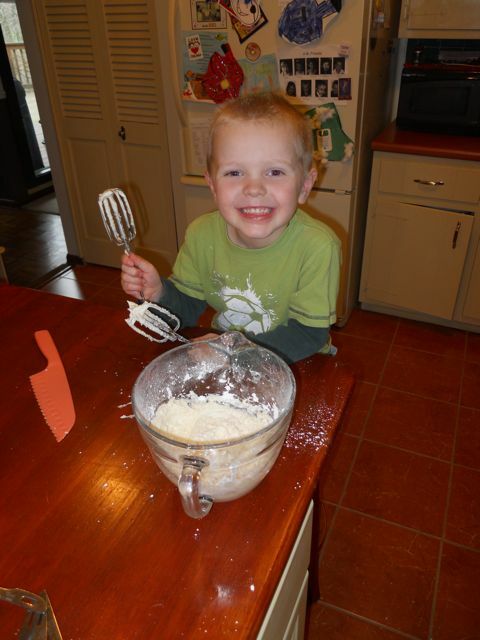 Thank you for sharing the whole process and especially the joyful pictures of your son at work. What memories you'll all talk about someday! a.
I do contact many of the authors we celebrate. Check out the author calendar -- if you see an asterisk next to the author's name that means they participated with a birthday memory. Wow! This is the first time I've seen your blog, and color me impressed! Great creativity and enthusiasm. What a great post, great ideas and yummy looking cake. (I'm now hungry for cake!) We are BIG fans of this series in our house. Thank you Julie! Which is your favorite from the series? Thanks for stopping by the blog! Cake was yummy too! Thanks Myra! I am so glad you were able to visit the blog. What fun you must have had with those kids -- and what fun those kids must have had with you. What a wonderful tradition you started! Now you've reached out & touched even more youngsters by it. Kudos! What a wonderful post! It was such a fun read. 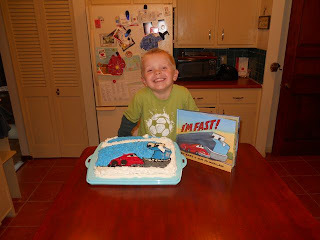 I love the cake and I loved how your son helped with everything. Even the frosting! It was awesome. Thanks for sharing. How awesome and fun! What a really cool thing to do. Your kids are so lucky! Congratulations on your blogiversary! Such a wonderful concept to keep up for so long!